Announcement Handmade, original and unique wreaths and floral arrangements for all occasions! A great selection of wreaths are available and I use all the materials listed such as grapevine, deco mesh, and burlap. Custom orders are welcomed! My wreaths, swags, and floral arrangements are handmade in my work studio in my home in a smoke-free environment. 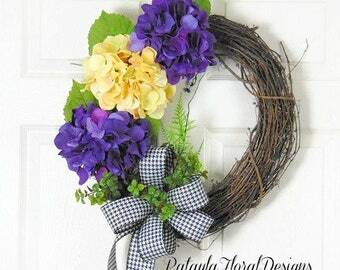 Handmade, original and unique wreaths and floral arrangements for all occasions! 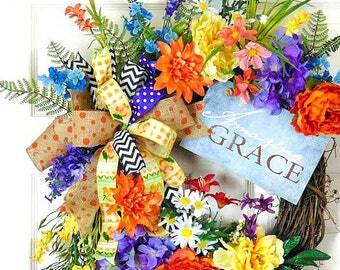 A great selection of wreaths are available and I use all the materials listed such as grapevine, deco mesh, and burlap. Custom orders are welcomed! I finally have the wreath on my door. Absolutely beautiful!! Love the contrasting bows and mixture of flowers, and of course the bird’s nest with eggs and mama bird watching. Highly recommend this seller!! 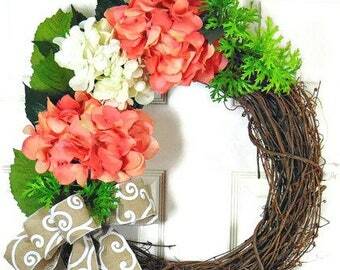 This wreath is what my first most popular wreath. I had about twent-five custom orders for this one wreath! Grapevine, Deco Mesh, Burlap Wreaths For Holidays, Everyday, And Seasonal! 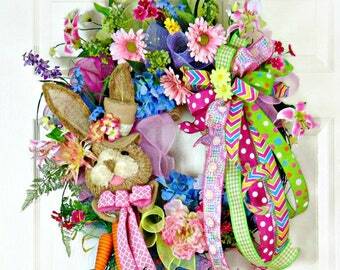 Celebrate With A Wreath!!! Welcome to PataylaFloralDesigns on Etsy! Hello! My name is Patsy Taylor and I am married to my high school sweetheart and best friend, "Carroll"! We have been married for forty-four years and we have had many memorable times along life's journey! We were blessed with a son, daughter, son in law, grandson and our schnauzer, Gumbo!. Our son passed away at age twenty with a brain aneurism. We cherish our memories! My husband had a military career and we also owned a successful real estate business. Later in life he surrendered to the ministry and is now a pastor at one of our area churches. We enjoy working for the Lord and we love our church family! Working for the Lord has been a blessing in so many different ways. I haven't always been able to work. There was a time in my life when I couldn't function, I could barely get out of bed to take care of my own personal needs, but thankful that I could do some things! God was faithful to provide during those times. During the downtimes, as I begin to improve, I needed something I could do sitting down and working at my own pace. I always enjoyed working with florals so I purchased supplies and was off to a good start! It was so good to be busy again! Some shops, stores, and local people began purchasing my designs. I finally decided it was time to begin my business by selling on the internet. It has been a delightful journey working with my customers that I truley appreciate! I gladly stand behind my work and offer returns. Please contact me if you are returning an item. Returns must be shipped back to me, at your expense, within 3 days of receiving the item. Once I receive the item, I will issue a refund of your purchase price, minus the original shipping charges. If your package or item is damaged at the time of delivery AND YOU DID NOT REQUEST INSURANCE THEN YOUR ITEM CAN'T BE REPLACED. If you did purchase insurance, you must keep the box, packaging materials and item or items. INSURANCE WILL NOT PAY IF YOU DID NOT KEEP THESE ITEMS. If you select to have insurance at the purchase, payment CAN NOT BE PAID until I am refunded through the insurance. Please pay by Credit Card or Paypal at the time of purchase. Sales Tax: Arkansas residents, please add 9.00% sales tax. I generally ship through USPS. In most cases I ship the same day or the next, depending on the time of day that I receive the order. Each case differs when it is a custom order, so it is best to determine the time factor involved at the time of the order. I do not insure my items. YOU MUST REQUEST INSURANCE TO BE ADDED UPON PLACING YOUR ORDER. If you need shipping to Alaska and Hawaii I will have to calculate shipping charges before you purchase. My wreaths are packaged with care and wired in heavy duty shipping boxes for the appropriate size. Floral arrangements are also packed with care, using plenty of bubble wrap for the vase and making sure the arrangement will not shift in the new shipping box. Embellished picture frames are wrapped in bubble wrap, secured to arrive safely. I will be glad to visit with you concerning a custom designed order for your decor. Please do not hesitate to contact me.